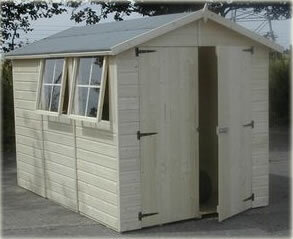 This 6' (1824mm) wide, Apex double door shed is available in 3 sizes from 6x5'6" to 6x9. All sizes have at least 1 opening window with 2 in the 6'x9' model. Optional side roof extensions in 6' and 9' lengths. Optional extra windows. Delivery notice: These buildings are available nationwide but there may be an additional delivery charge for the following areas; Wales, Devon, Cornwall, North England. Please contact us prior to ordering if this applies to your area. If you live in the East Anglian region, please see our East Anglia section.